Sometimes sports are so breathtakingly amazing that words don’t do it justice. That’s how I feel after watching the Giants win the Superbowl. I’m trying to find words to describe their run to another championship – their second in four years – but I still don’t know how it happened. I guess we can start with Eli Manning. From the final regular season game through the Superbowl (five must-win games), he was nearly flawless: 130-196, 1565 yards, 12 touchdowns, 1 interception. I think we can put to rest any questions of Eli’s level of play. He has become the best quarterback in New York history. The defense was outstanding. In four games they allowed a total of 56 points to four elite offensive teams. 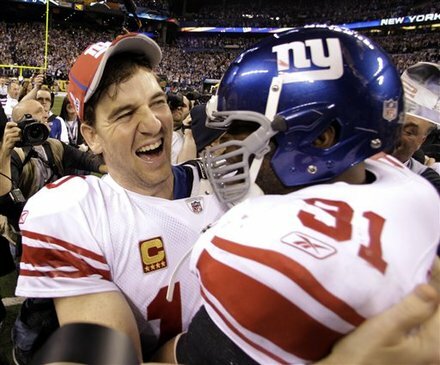 In the playoffs, the Giants beat the NFC’s 2 seed and BOTH 1 seeds. The teams they beat in the playoffs had a combined regular season record of 52-12. The games were close, hard-fought, and played in tough environments…and each time the Giants prevailed. But again, at a certain point words don’t do it justice. I’m thrilled to have seen my teams win four championships – and believe me, I don’t take them for granted. The Giants in ’08, the Yankees in ’09, BC hockey in ’10, and now the Giants in ’12. Thanks for a great ride. See you in September, NFL.